When cleaning up workplace spills of oil and chemicals the standard practice has been to spread a bag of kitty litter over the spill. Anyone who has done this will testify to what a messy and time consuming task it becomes. 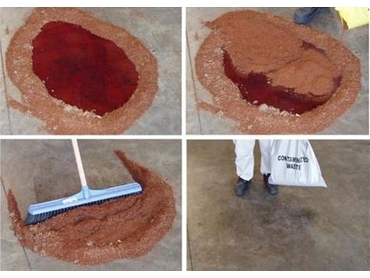 Spill Station Australia now offers a cost effective solution to these inefficient kitty litter absorbents. Mineral Sponge is a granular absorbent made from zeolite and is able to absorb 80% more than outdated clay alternatives. It is de-dusted and is available in the workplace safe sizes of 10kg and 2.5kg bags and is suited for high wind areas. One 30 litre bag of Sukerup 100% organic absorbent will absorb the equivalent of 3 x 30 litre bags of kitty litter and the savings do not stop there. The impressive effectiveness of this absorbent means less absorbent needed, less clean up time needed and greatly reduced disposal costs. The 30 litre bag weighs only 8 kg so it is much safer than carrying 20kg bags of kitty litter around your site.